I'd watched show Tattoo Hunter of Dr. Lars Krutak on Discovery channel. 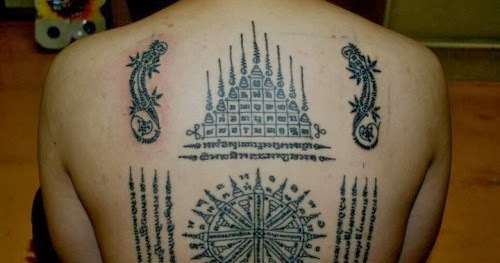 And he had Buddhist tattoo by Thervada monks. There was an Elephant, Tiger and Crocodile tattoos. And who had those tattoos they have power of these animals. So I want to know more about meaning of that art and techniques and may I think those powers are because of techniques and meditation. Is this art and techniques discovered by Buddha? It has nothing to do with Buddha and his teachings, although sometimes parts of Suttas (Pali) are used in the text. Mostly the texts recites Brahmanic-verses (Sanskrit), sometimes mixed. The script here is mostly - like here in your samples - Khmer (Cambodian), which was used also in Thailand till a Thai King invented own script. This so called "yoan"s "yantras" are protective charms, also used for flags which are placed on the roof cross-beams of a house. Usually soldier hire "monks" to do these, especially those active in war. Many monks in SEA have been soldier. 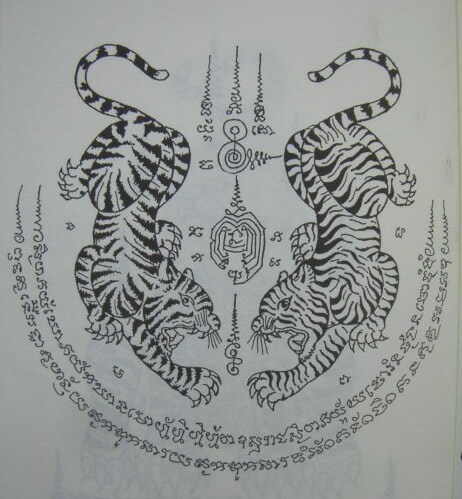 In regard to tattoos being "done by monks": The Buddha called that a "livelihood of animals". It is not allowed and is a second-heaviest violation of the Vinaya (rules of monks). You may understand that my person will not put effort into translating it. Just a general notes, regarding tattoos: beautification of the body is not something conducive for one's real protection and practice. Not to speak of harming the body unnecessarily. Today there are many monks making livelihood with such, even paint themselves. Most (not all) can be considered as outside of the Buddha's disciples. Today's monks doing such usually have also not even an idea of meditation, which one ever. It you wish to translate it, here a list of the script's letters. You could in this way write Pali in Roman letters, and then either ask Pali/Sanskrit scholars or search dictionaries. Since the script is different to modern, my person attached a picture including the older script. Not the answer you're looking for? Browse other questions tagged theravada art or ask your own question. Does Theravada Buddhism accept Jataka Stories? Is love a destiny or coincidence in Buddhism?